Even the wisest scholars of Candlekeep know only a little of what lies beyond the realms of Faerûn. While heroes, explorers, diplomats, and merchants have traveled beyond Faerûn, rare indeed is the person who has visited more than one particular region outside the commonly known lands. The Hordelands stretch for hundreds upon hundreds of miles, east from the lands of Rashemen and Narfell. Yet east of east, beyond the sunrise, lies a vast and marvelous land of legend known as Kara-Tur. Mountains as tall as the sky, impenetrable jungles, and empty grasslands claimed by the fierce Tuigan tribes stand between Faerûn's easternmost lands and the sprawling empires of Kara-Tur. Kara-Tur is reputed to be a land of silk, spice, and gold, a beautiful land ruled by haughty and cruel warlords. Travelers speak in awe of the Shou Empire, a kingdom thousands of miles in extent guarded by a mighty wall. In Shou Lung, it is said, the temples are roofed in gold, and the Emperor presides over a court of a thousand kings and a million swords. From these fantastic lands a single trade route wends its way westward. The Golden Way crosses the great expanse of the Hordelands, winds through Rashemen and Thesk, and finally meets the Inner Sea at the port of Telflamm. Here Shou silk and exotic spices from the isles of Wa arrive in Faerûn after a journey covering thousands of miles and lasting many months. The Golden Way remains open only at the sufferance of the Tuigan, who sometimes exact ruinous tribute for their forbearance or shut down the road altogether. Ten years ago, bold mercenaries in the service of Amn dared the Trackless Sea, sailing into the sunset for week after week until they reached an unexplored land beyond the sunset - Maztica. Fighting against the strange warriors of the land, they established a foothold on the western continent. Several powerful merchant companies now struggle to wring wealth from this new land. Trade, discovery, and no small amount of fighting against hostile Mazticans and competing Faerûnians is the result. Even less is known of Maztica than of Kara-Tur. It is a land of forbidding natural barriers and hundreds of remote, reclusive cultures, most of whom are hostile to each other. Every year more gold, gemstones, and valuable new crops such as vanilla and coffee are brought back to Faerûn in Amnian carracks, a one-sided trade that promises to enrich that nation beyond belief. 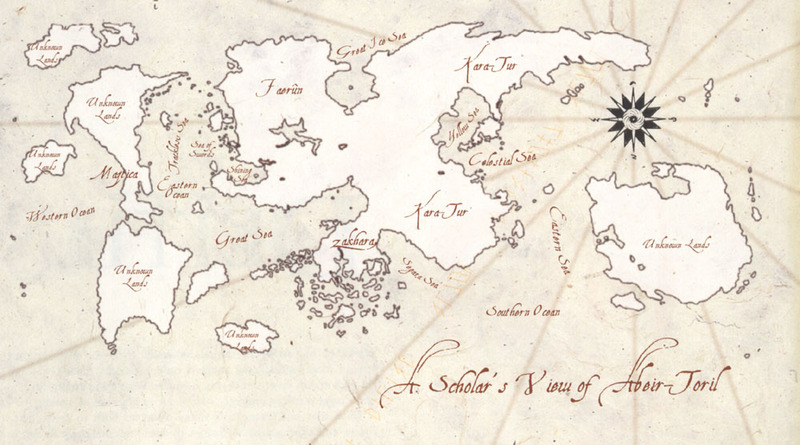 The best known and most frequently visited of Faerûn's neighboring subcontinents, Zakhara lies beyond the Great Sea to the south and east. Zakharan dhows are a common sight in the ports of Halruaa, Nimbral, Dambrath, and Luiren, and sea merchants of those lands report that a desert land of hidden wonders and subtle culture lies only a few hundred miles across the sea from Faerûn's southern shores. Zakhara's shores are plagued by particularly fierce and numerous corsairs. They demand heavy tribute and sometimes close off sea travel to the exotic southern land altogether. Even when the way is open, Faerûnian travelers are not always welcomed in Zakhara's secretive cities. Zakhara is a land of great deserts, lush oases, and powerful genies who meddle in the affairs of humankind. It is united by a powerful faith inspiring piety, zeal, and honor, yet tales tell of demon-haunted cities and godless sorcerers who wield strange magic. The last and most fantastic of the lands beyond Faerûn - so close that every Faerûnian has seen it from afar. Above the sky lies a realm of incredible expanse, the so-called Sea of Night, where rivers of stars and worlds both strange and wonderful shimmer like silver fire in the dark. Stories abound of wizards who seek to climb above the sky and explore its dark waters, of princes ruling castles of argent light, and crystal elf-ships that rise gleaming from the western seas into oceans vaster and more wondrous still when twilight falls over the face of Toril. In a land where wizards make castles fly and clerics bring forth godly miracles, the legendary isles and realms of the night sky are home to the wildest flights of fancy and strangest dreams of all. Toril's moon is known as Selûne. Through careful observations and persistent divinations, sages have determined that it circles Toril at a distance of about twenty thousand miles. While Selûne in the sky appears no larger than a human hand held at arm's length, it is a world in its own right, easily two thousand miles across. Selûne is bright enough to cast pale shadows when full. It is accompanied in the sky by the Tears of Selûne, a number of smaller luminaries that spread across the sky in a great arc trailing the moon. Children's tales tell of pirates in flying ships who come down from the Tears to raid and plunder, but no one takes these stories seriously. Selûne's orbit around Toril is almost in the same plane as Toril's orbit around its sun, so solar and lunar eclipses are frequent. Solar eclipses are never annular (the sun's edge cannot be seen during totality) and almost never partial, because Selûne's shadow on Toril and Toril's shadow on Selûne are quite large. Eclipses are thus spectacular but rather commonplace. Inhabitants of any particular land do not always notice such eclipses, since the rising and setting times for Selûne wander across the calendar. Solar eclipses might briefly cause nocturnal beings to awaken, but they quickly return to sleep once daylight returns. Selûne is full at exactly midnight, the first of Hammer, 1372 DR, and every thirty days, ten hours, and thirty minutes thereafter. The time between successive full moons is, technically speaking, one synodic month, the time from one Sun-Toril-Selûne conjunction to the next. Selûne makes exactly forty-eight synodic revolutions every four calendar years on Toril. Thus, Selûne is full at exactly midnight on the first day of every leap year, and has the same phase on any calendar day four years forward or backward in time. One Faerûnian holiday, the Feast of the Moon, is held during a full moon that obligingly shows up on or about that day. Because Selûne's synodic period is so close to the actual length of the calendar month, Selûne is full around the first day of each month or on festival days, give or take a day or so. The annual festival days serve to correct discrepancies between the synodic and calendar months, with Shieldmeet providing a necessary correction every fourth year to keep the full moon from sliding deep into each month. The Tears of Selûne are a collection of hundreds of very small but bright celestial bodies (asteroids) that orbit Toril in Selûne's wake. The Tears act like any such bodies in a Trojan point, meaning that they do not stay in place but actually orbit around a common center in whirlpool fashion. Viewed from above, the Tears appear to be a very large disk of hundreds of assorted bodies, none of any remarkable size. The Tears are visible as points of light like stars, too small for viewers to discern their actual shapes. The individual orbits of the Tears are not exactly coplanar with the orbit of Toril and Selûne, but they are close. As a result, their appearance in the night sky of Toril is that of a flattened ellipse of bright "stars," trailing Selûne by sixty degrees across the sky, along the ecliptic. Typically, an average human can cover Selûne's image with his clenched fist at arm's length; the Tears, however, appear to span an area of the night sky almost three handspans wide and about three fingers deep at arm's length. The relative positions of individual Tears change from night to night as they orbit their common center. The Tears are not bright enough to be seen during the day, though Selûne often is. Though the Tears are bright even when Selûne is new, they are not always visible in the night sky, since they too have rising and setting times, and thus might not be up at night. The first Tear rises or sets about four hours after Selûne does. Because it is so long, the full set of Tears takes about three hours to rise or set from first Tear to last. The combined effect of the Tears is not enough to cast shadows at night. Like Selûne, the Tears are believed by some sages to be inhabited, though very few people could make a reasonable guess as to who lives there. Fewer still have actually been there and reported back. For centuries, astrologers have observed the appearance of one or two particularly bright stars close to sunrise and right after sunset. Anadia and Coliar arc sometimes known, as the Dawn Heralds, although they might just as easily be called the Evening Heralds too. These, too, are worlds much like Toril, only closer to Toril's sun and so never observed very far from it in the heavens. Coliar is the larger and the brighter of the two, and also the one usually found higher in the night sky. Deeper in the Sea of Night roam the Five Wanderers, inconstant stars that do not follow a yearly path across the sky as the other stars do. These Wanderers are markedly different from the star-rivers through which they ream; they tend to be larger, brighter, and show wondrous colors and features when scried closer. Karpri, the nearest, is a sapphire orb with great whitecaps at top and bottom. Sages say that it roams millions of miles from Toril, if such a thing can be believed. Chandos, the next, is a brown-green smudge whose markings change oddly over a few nights' watching. Glyth is a dull gray, but surrounded by a spectacular ring and three lesser bodies, visible only with magical aid. Garden is a tiny green sparkle, rarely seen. The last, H'Catha, seems to be a very large world very far away, a gleam of diamond white.